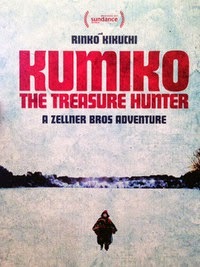 Following on from 2012’s Kid-Thing, a feverish tale about a destructive young girl operating freely beyond all tangible moral boundaries, the Zellner brothers returns with Kumiko, the Treasure Hunter (2014). Perfectly pitched between lighthearted whimsy and all-out absurdity, the Zellners’ latest is a forlorn tale about our own obsession with storytelling and a deconstruction of the definition of a ‘true story’. Titular protagonist Kumiko (Pacific Rim’s Rinko Kikuchi) lives a solitary life, sharing her tiny apartment with her pet rabbit, Bunzo. At work she’s bullied by her boss and ignored by her co-workers, whilst at the same time constantly harangued over the phone by her ultra-domineering mother. For Kumiko at least, life has chosen a different route – namely that of a Spanish conquistador, and one who’s determined to travel to the Americas in search of wealth and fortune. She’s miraculously (through the power of her beloved and archaic VHS player) discovered the whereabouts of a hidden briefcase of money, buried somewhere between the state border of Minnesota and North Dakota. Complete with a crudely sewn treasure map and a pocket book full of notations, our quirky protagonist embarks on a journey to a little-known, snowy town called Fargo (ring any bells?). It’s impossible to tell if Kumiko is mentally ill or merely just another lost soul who has somehow failed to integrate into society, which is largely down to the sublimely delicate performance of Kikuchi. Inspired by the similar ‘real life’ case of Takako Konishi, whose body was found in the snow after being obsessed with finding the cash buried by Steve Buscemi in Fargo (though this has never been proven), the Zellners have decided to ignore the truth of Konishi’s tale and instead create a narrative based on the media sensationalism that accompanied it. A cross-cultural tale of East meets West, Kumiko, the Treasure Hunter comes into its own the moment its titular star crosses the vast Pacific Ocean. Whilst in Japan, David Zellner keeps his camera perfectly rigid, restraining himself and in turn recreating the aesthetic of a contemporary Japanese drama – full of subtlety and cinematic slight of hand. This all goes out the window once Kumiko reaches the United States, where the Zellners switches to a more recognisable form – namely one befitting the indie directors whose dark comedy inspired the film’s narrative. Though the Zellner brothers’ direction may be more reticent than that of the Coens, each of the characters Kumiko encounters wouldn’t be out of place in one of their madcap farces. Whilst the Coens often focus on affable losers caught in an inescapable downward spiral, here we see Kumiko suffer the same fate, blinded by obsession and on a precarious trajectory towards an irrevocable conclusion. Sweet, playful and incredibly endearing, Kumikois a seductive tale about the allure of imagination. Sundance London 2014 takes place at the O2 Arena from 25-27 April. For more of our coverage, follow this link.